Authorities are trying to find the person who taped a dog’s mouth shut with electrical tape. The Lee County Sheriff’s Office said that when the dog was found Tuesday it was dehydrated, appeared malnourished and was bleeding from wounds on his left arm and chest. The dog has been seen by a veterinarian and is resting comfortably at Lee County Domestic Animal Services, deputies said. Deputies said they are asking for help finding out who owned the dog. I hope they find the person responsible. Glad the dog was found. Poor thing. Hat tip to ghosttruck. Chance looks and sounds familiar, but I couldn't find the original story. A dog found wandering Southwest Florida with its snout taped shut last month has been given a second chance after the sheriff’s office that rescued the abused canine adopted—and “deputized”—the pup. 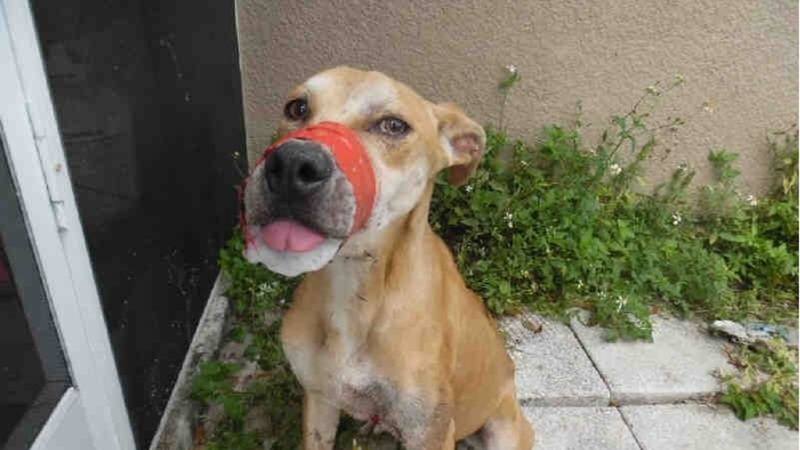 The Lee County Sheriff’s Office said they “deputized” the male Florida cur, now named Chance, whom they rescued after residents reported the canine was roaming through backyards in Lehigh Acres, located about 16 miles east of Fort Myers, with red electrical tape wound around its muzzle. “Having been deputized last Thursday, eager to get his paws dirty, Deputy Chance sprang into action this weekend,” the sheriff’s office wrote Tuesday on Facebook. The sheriff’s office said Chance was recovering nicely and was “bursting with energy” about one week after finding the dog dehydrated, malnourished and bleeding from wounds on its left arm and chest. Once fully recovered, Chance will serve the department as a “Pets on Patrol Spokes-Dog” and will even get his own “office” near the desk of Sheriff Carmine Marceno, who adopted him, FOX13 Tampa reported. Police are still looking for the individual who abused Chance. I'd love an update with some perps this pooch takes down! It sounds like, though, that Chance's job is more of a goodwill ambassador than cop. He sure is a good looking cur. The way the light is shining on his nose makes it look like he has a snarl or smirk. Overall he looks like he's ready to get down to business.